From PreK-5th grade, our students were engaged in meaningful storytelling, personal reflection, and discussions about the complexities of both individual and systemic racism. 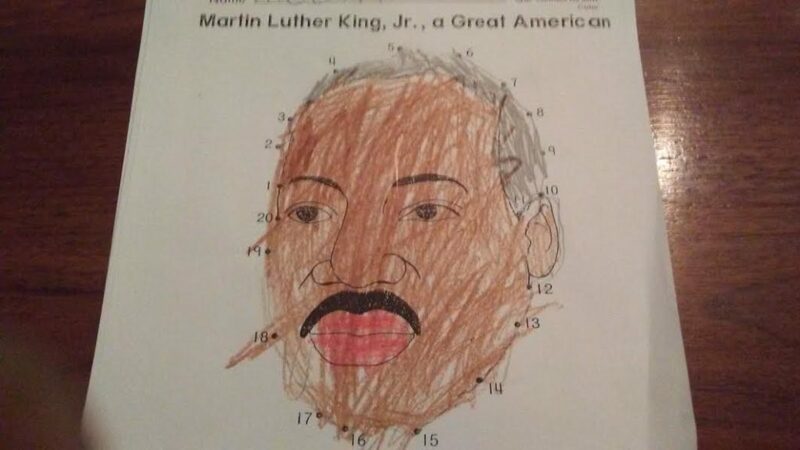 Happy Birthday, Martin Luther King, by Jean Marzollo, was read in PreK, and helped explain how Dr. King helped to change unfair rules and laws in our country. 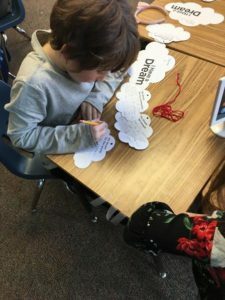 Kindergarten read Martin’s Big Words, by Doreen Rappaport, which highlights the importance of spreading words of love and peace even when others are spreading words of violence and hate. The children tied this story into our 2018-2019 school-wide theme of “seeking peace” by talking about how Martin’s big words can still affect us today, and brainstormed ways of spreading love and peace. 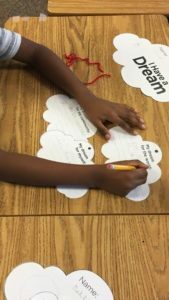 In a reflection and visioning activity, 2nd graders wrote dreams for themselves, their communities, and the world. 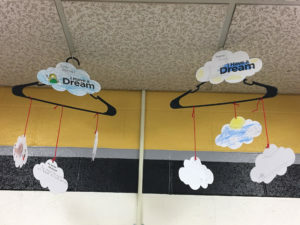 Their dreams are displayed on mobiles in our school library as a hopeful reminder that together, the world can be changed in both small and big ways. 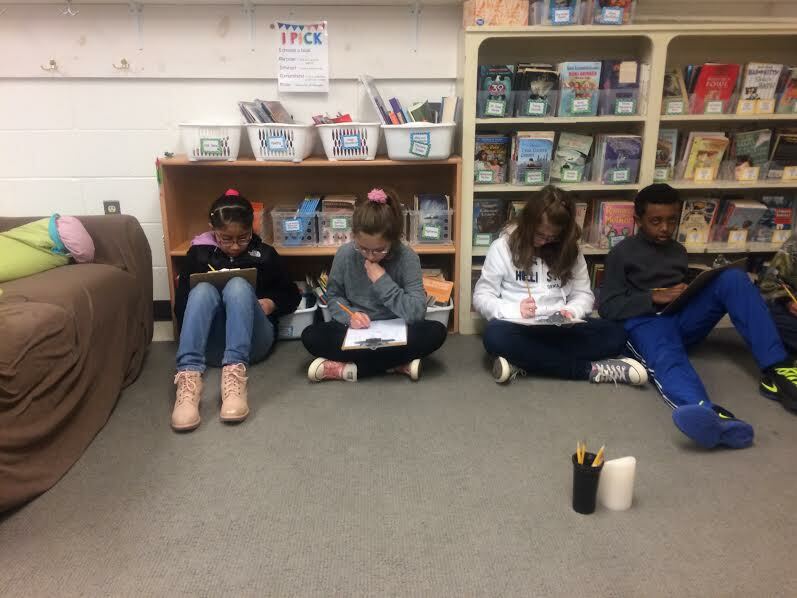 5th graders looked not only to the famous “I Have a Dream” speech, but at some of Dr. King’s other influential speeches and letters. The class did a scripture match activity to find which Bible passages inspired certain lines in Dr. Kings written works. Students discussed how these works show Dr. King’s vision of “the kingdom of God,” and how they can be a part of that through individual actions and also through advocating for systemic change. Tough questions from students such as “so how do you stop racism?” and “does telling people to treat people fairly actually work?” do not seem to have an easy answer, but we remain committed to engaging in this important work in meaningful ways both on special days and every day. Faith Statement #4 – Our school provides a welcoming community where it is emotionally safe to raise questions, to value and learn from differences, and to care for each other. Faith Statement #5 – The school enables students to practice global awareness, cultural sensitivity, anti-racism, and compassionate living.